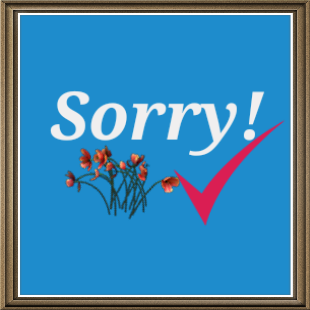 The word " Sorry" is of a great respect which addresses the human soul and heals the wounds. I think you agree with me when I say that the strong people can apologize while the poor ones cannot apologize. We believe that the rejection of the apology makes the others pain and it may worsen the relationships in all societies. The apology is considered as a substitute for grudges, hatred and division. This era calls us to work together in order to enhance the principles of the culture of admission to heal the psychological wounds with the phrase ""Never mind"". We need to stand together against all criminals, murderers and renegades. We need to stand against the acts of revenge and fragmentation in order to build successive generations enjoying the civilized world. In fact, there are those who accept this ""culture"" and those who do not accept it. There are those who seek to be revived for some considerations and values that our societies have known since the ancient times. It is wrong to think that the culture of apology may make some weak and submissive to others. To conclude, the culture of apology that emanates from the tendency of tolerance cannot be removed by any group in this existence. Otherwise, any behaviour or education which is free from the culture of apology among people can be applied in savage societies of "The strong eat the weak".